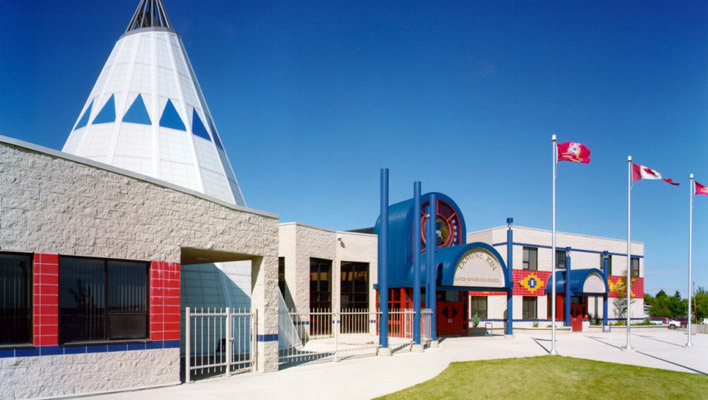 Ermineskin Junior Senior High School is located on the Ermineskin First Nation in Maskwacis, Alberta. We are a Cree School, and are dedicated to delivering quality educational programs aligned with Alberta Education standards and curriculum in a setting in which students acquire the knowledge, skills, and positive attitudes to become responsible, caring citizens. Plains Cree culture, values, and traditiions are integrated into this curriculum and into the daily routines of the school. Our school staff consists of 47 team members who provide quality instruction to over 300 students attending grades 7 through 12. Ermineskin High School graduates are responsible thinking and caring First Nations people. They are ready to continue learning or enter the workforce, with the skills and abilities they need to fulfill their own expectations. They will speak Cree and have a strong knowledge of the Maskwacis History and Cree culture. They are ready to participate actively and positively in their communities and in shaping the future of their province, their country and the global community. EJSH students take action to contribute to a safe, healthy, and vibrant school and local community. To foster MIYO WAHKOTOWIN so that Ermineskin Junior Senior High School is a safe, happy, and caring place, where every student is encouraged, supported and appropriately challgend in his or her learning. To deliver high quality educational programming that integrates and reflects the Plains Cree perspective. To use restorative practices to promote respect, responsibility, and student autonomy.